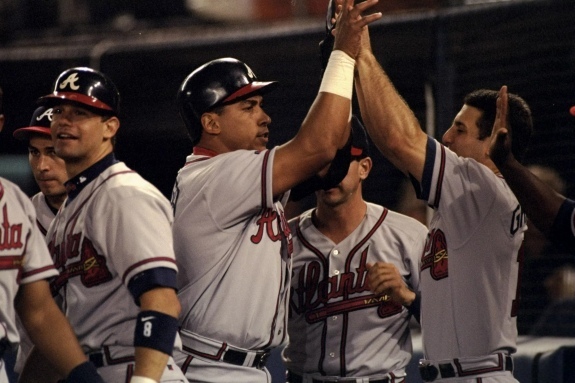 Andres Galarraga celebrates after slugging a seventh-inning grand slam giving the Atlanta Braves an 8-3 lead over the San Diego Padres. My career ambitions gravitated toward marketing and communications from an early age. During high school, I assumed that career trajectory meant I'd be directing commercials and designing ads while hobnobbing with sports icons like Michael Jordan and Bo Jackson during filming and photo shoots. Oh, the naivete of a teenager navigating an era that was neither '80s neon nor '90s grunge. During my nearly 25-year marketing and communications career, I've spent a better portion of that time consulting the latest AP Stylebook to determine proper word choice, capitalization and hyphenation. Earlier this summer, I was finalizing a baseball research project and consulting both the AP Stylebook's sports section and comparing it with the Society for American Baseball Research (SABR) guide. I can't wait to share details about that project. Think Chicago Cubs baseball but in a different venue. Around Thanksgiving 2018, I needed to consult my 2018 AP Stylebook for a project at work. I randomly decided to flip to the baseball section. Under AP's baseball entries, they include sample box scores and line scores to demonstrate how journalists should properly document games. In the past, I discussed how I enjoy attempting to identify undated game photos (here are one, two and three examples) so I decided it was time to identify the actual games that AP uses as an example. Are they real games? Perhaps they are meaningless spring training exhibitions or completely fabricated contests? The first game listed showed the Atlanta Braves beating the San Diego Padres, 8-3. After glancing at the rosters, I used Padres pitcher, Mark Langston, as my key. Prior to checking his Baseball Reference page, I knew he spent most of his playing days with the Seattle Mariners and California/Anaheim Angels. Langston pitched from 1984 through 1999, and his only season in San Diego was 1998. 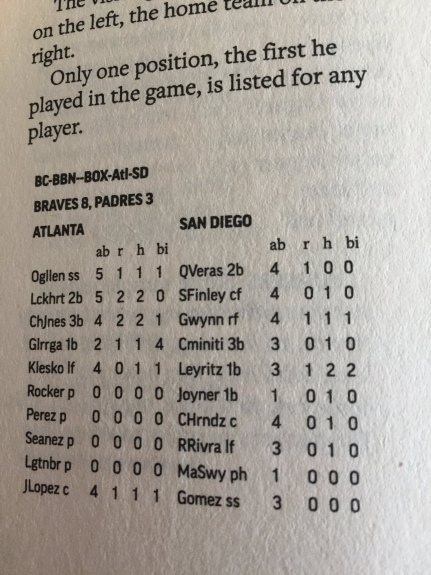 The Braves and Padres played nine times during 1998, and only one three-game series in San Diego. After checking all of that season's contests between the teams, none of the regular-season games ended with an 8-3 score. But of course, they met in the postseason. 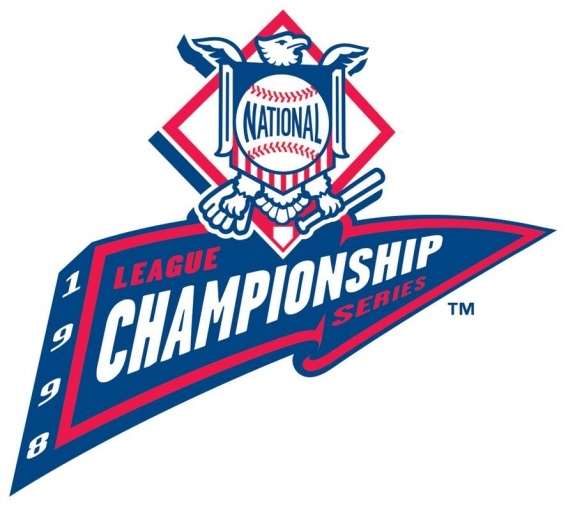 It's Game 4 of the 1998 National League Championship Series at San Diego's Qualcomm Stadium. Entering Game Four, the Padres held a 3-0 series lead over the Braves and needed just one win to claim the franchise's second National League pennant. After taking a 3-2 lead into the seventh inning, the Padres' pitching staff imploded. Braves catcher, Javy Lopez, tied the game with a solo home run off of Padres starter Joey Hamilton. 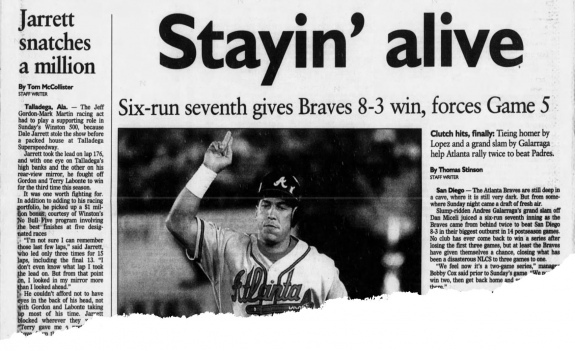 Andres Galarraga's seventh-inning grand slam off of Dan Miceli proved fatal. Braves pitcher, Dennis Martinez, earned the win (the last of his MLB career). After all of these years, I'm not sure what prompted me to determine whether or not they were authentic game summaries. Sure enough, they are (Baseball Reference, Retrosheet). 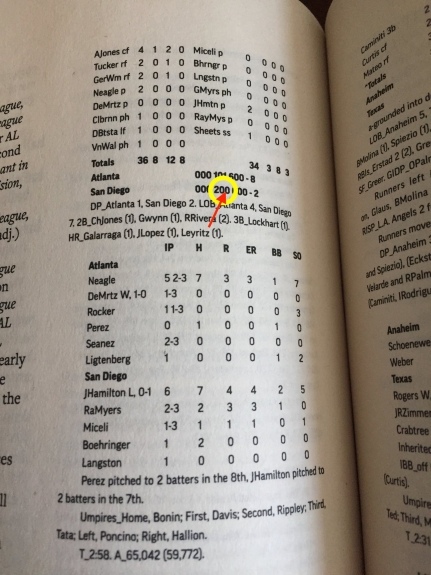 NOTE: AP omitted the home run by Jim Leyritz in the bottom of the sixth inning (circled in photo).